In 2014, I wrote about the brick wall surrounding the Irish origins of my great-great grandmother Martha Bagnall Shearman.1 Thanks to the generosity of a new-found distant cousin, I have now demolished that brick wall, moved the family tree back another six generations and discovered additional Shearman family branches in New Zealand and the United States. I knew that Martha Shearman was born in Waterford, Ireland, married Charles Francis Smithers there in 1844 and came to Canada three years later.2 Because of Charles’ career in banking, the Smithers family lived for several years in Brooklyn, New York, and I discovered that two of Martha’s brothers and a sister had also immigrated to Brooklyn. I knew nothing, however, about the Shearman family’s roots in Ireland. I posted the article online and eventually Lorraine Elliott, who was born in New Zealand and lives in Australia, came across my blog, Writing Up the Ancestors. She contacted me to tell me that her ancestor Robert Clarke Shearman,3 a New Zealand policeman, was another of Martha’s siblings. The clue that helped convinced her we were related was a photograph in her great-great-grandfather’s album identified as Maria Boate, Martha’s and Robert’s sister in Brooklyn. Some years ago, Lorraine’s research had led her to a genealogy of the Shearman family written in 1853 by John Francis Shearman (I’ll refer to him as JFS). He was a cousin of Martha’s and Robert’s, an amateur archaeologist and a Catholic priest. (Some of the Shearmans were Protestants, others converted to Catholicism.) This document is in the archives of the National University of Ireland at Maynooth, near Dublin. She sent me the notes she had on that document, along with some of her own research on the extended Shearman family. The JFS genealogy takes the Shearmans back to the mid-17th century when Thomas Shearman (c 1610-1704) came to Ireland from England with Oliver Cromwell’s invasion forces. He then settled in Burnchurch, County Kilkenny. Subsequent generations of Shearmans lived in and around Grange, not far from Kilkenny City. Grange House, now long gone, was once on this road in County Kilkenny. Lorraine’s notes stated that Martha was one of 13 children, and that their parents were Thomas Shearman (c 1785-1850) and his wife, Charlotte Bennett Clarke (no dates available).4 Her research suggested that Thomas lived in Dunkitt, Kilkenny, near the city of Waterford, but other sources say that he was from the nearby city of Waterford. Perhaps he lived in Dunkitt in his early life, then moved to the city. 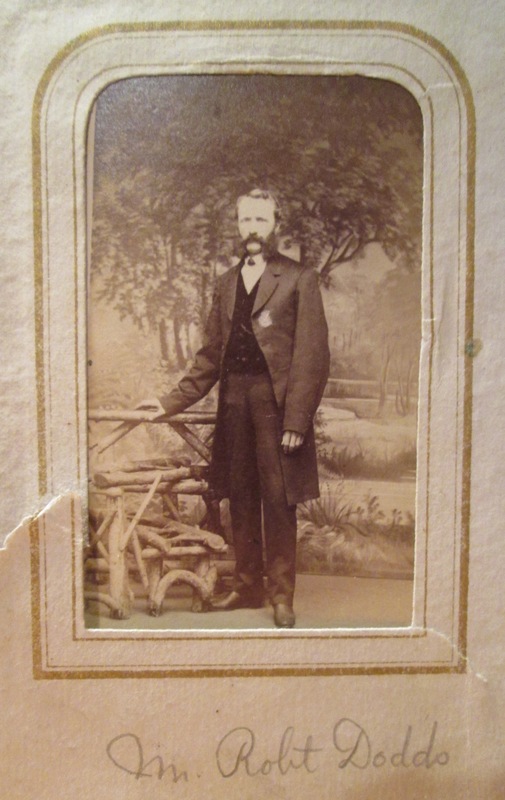 I recently came across another Shearman genealogy on familysearch.org.5 This 15-page manuscript was written in 1863 by a member of another branch of the family, George Shearman (1818-1908) of Penn Yan, a small town in New York State. It was clearly based on the family history written by JFS 10 years earlier, and it added more detail about George’s line and had less information about mine. It listed Thomas Shearman and named his sons, but only mentioned that he had five daughters. All this information comes with a caveat: neither of these documents meets the requirements of genealogical proof standards. The names and dates of birth, marriage and death were probably based on family records and anecdotes and parish records that existed at the time, but today there are no official records in Ireland to back them up. Nevertheless, records of the Shearmans can be found in various cemeteries, old Irish city directories, newspaper articles, Tithe Applotment Books and indexes of wills. Kilkenny researcher Edward Law found numerous records pertaining to Grange House, home to my Shearman ancestors, and the librarian with the Kilkenny Archaeological Society, Rothe House, Kilkenny was extremely helpful in my search for traces of the family. This article is also posted on writinguptheancestors.blogspot.ca. Robert S. Hill, “Shearman, Robert Clarke”, from the Dictionary of New Zealand Biography, Te Ara – the Encyclopedia of New Zealand, http://TeAra.got.nz/en/biographies/1s10/shearman-robert-clarke. Note that this article says Robert’s uncle was William Hobson, first governor of New Zealand; Lorraine has been unable to confirm that. Charlotte was the daughter of Waterford pewter manufacturer Charles Clarke and his wife “Miss Bennett, late of Bath.” My maternal line has now come to another brick wall. A precious item hung in our hall while I was growing up, made by my great, great grandmother. I often wondered about the woman who made it. Finding out about her was one of my first genealogical searches. The sampler was made of rough woven linen with cross stitches of bright coloured wool. There were red strawberries, green and yellow borders and rows of letters and numbers. What was very clear on the sampler were the words in black, “Susan Dodds and Tattinclave” and the date “Aprile 12 -19, 1840.” I knew the family came from Ireland and finally discovered that Tattinclave is a townland in County Monaghan, Northern Ireland, just north-east of Castleblaney and Oram near the Armagh border. That was the where, then there was the who? Many samplers have a saying or a motto embroidered on the bottom but unfortunately here, there is much wear making Susan’s difficult to read. What can be read is “lord our spirits” showing that Susan was a religious person. After they arrived in Toronto, Alexander worked as a carpenter while Susan began raising children. Their first child Eliza Jane was born in 1844, but died the next year. They had seven more children, another Eliza Jane, Mary, Robert, William, Isabella, James, and Joseph who would have kept Susan busy. It was the last, little Joseph, who appeared to have had the greatest effect on their lives. He died at seven years of age in August of 1871, falling from a pile of lumber. Perhaps his father was supposed to be watching him as at this point the family seemed to break apart. Even while mourning her son, Susan appeared to be a strong woman. She was recorded as the head of the household while her husband seemed to have disappeared. She held the family together as some of her children, Isabella and James continued to live with her until her death in 1896. 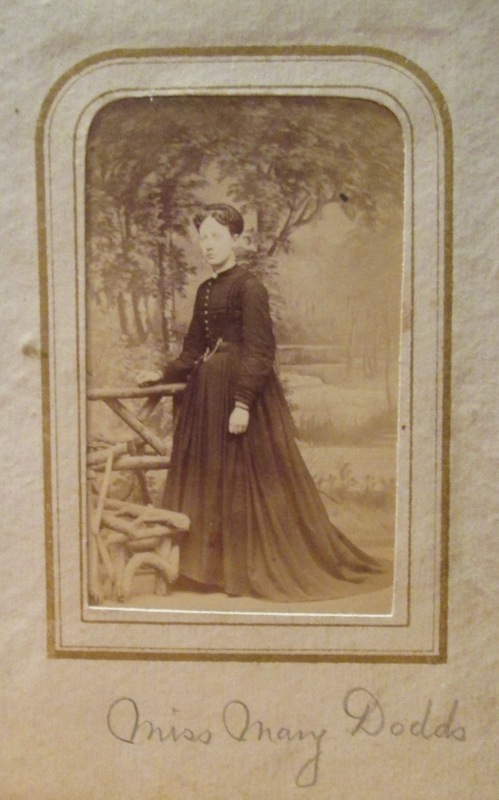 Her son Robert pictured with her here, died of tuberculosis in 1882. When my mother began down sizing, she offered us an item from the house every birthday. The sampler was my first choice. It now hangs on my wall. Dodds, Eliza. Register Book. Letter to Susan Bailey. October 16, 1871. Ireland. The booklet was sent after Joseph died. Dunlop, Samuel, Rev. Letter to To Whom It May Concern. 13 Apr. 1843. Ireland. In author’s possession. 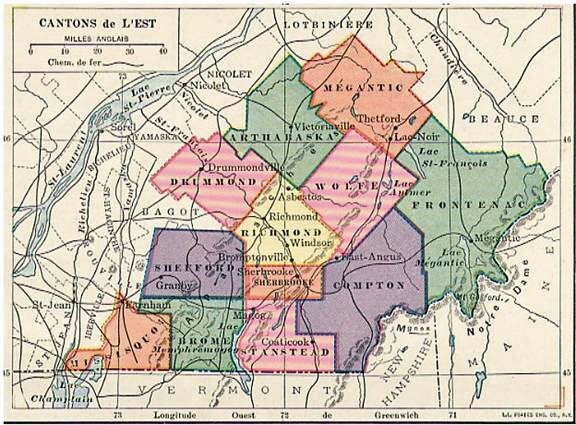 “Canada Census, 1881,” index, FamilySearch (https://familysearch.org/pal:/MM9.1.1/MVF7-172 : accessed 19 Nov 2014), Susan Bailey, Yorkville, York East, Ontario, Canada; citing p. 126; Library and Archives Canada film number C-13248, Library and Archives Canada, Ottawa, Ontario; FHL microfilm 1375884. With the help of Google I found the whole quote on the sampler. “Swiftly thus our fleeting days, Bear us down life’s rapid stream. Upward lord our spirits raise. All below is but a dream.” This is the second verse of a hymn “While with Ceaseless Course the Sun” by John Newton who also wrote Amazing Grace. It was in a book, Olney Hymns London: W Oliver 1779. Book II Hymn I. The place-name is also spelled Tatinclieve or Tattintlieve. It is 219 acres, in the county of Monaghan, the Barony of Cremorne, the parish of Muckno, Poor Law Union in 1857 in Castleblaney and in the Town land census of 1851 Part I, Vol III page 262. It is assumed Susan’s parents were James Dodds and Jane McKee. There is a James Dodds renting 44 acres ( the most land in Tattinclave) in 1861. There is also a record that James Dodds was an elder in Garmony’s Grove Presbyterian Church in 1840. Rev Samuel Dunlop was the minister in Garmony’s Grove Presbyterian Church from 1822 until his death in 1848. Garmony’s Grove was originally set up in connection with the Presbytry in Market Hill. The baptismal records only begin in 1844. Some of the people who attended this church may have been buried in Clarkesbridge or Newtownhamilton which is in Armagh. These three churches were united for a time. With the record of the marriage of Susan and Alexander being in Armagh, they might have been married in Newtownhamilton. This information was from Paula McGeough, personal communication. Everyone is Irish on St. Patrick’s Day. We all love to be Irish for a day on March 17. In my case, I treasure my Irish roots. Today, I will raise a pint of Guinness and toast my ancestors. Although my grandparents were Scottish, my great-great-grandparents, John McHugh and Mary Garret, were Irish. They were both born around 1820 in Ireland. They would have been young adults when the Great Famine, also known as the Great Hunger and the Irish Potato Famine happened between 1845 and 1852, when potato blight ravaged potato crops throughout Europe. Ireland was significantly affected and, as a result, one million Irish immigrated to other countries. We commonly hear about the Irish that moved to North America and Australia but a significant number of them immigrated to Scotland.1 John and Mary McHugh were among those who decided to go to Scotland. The following quote illustrates that the Irish were victims of discrimination. Unlike the above quote, we know the Irish to be hard working, disciplined and adaptable. I am proud to have Irish roots. So, despite what would have been great adversity, John and Mary settled in Scotland, lived in a Roman Catholic community and had children and grandchildren who worked in the textile industry. The generations of McHughs working in the textile industry in Dundee came to an end when their grandson, my grandfather, Thomas McHugh, could no longer find regular work in the textile industry in Dundee and decided in 1912 to move to Canada. A toast to the Irish! I wish you all a very happy St. Patrick’s Day. I have stuff, lots and lots of stuff. I have letters tied with string, photographs in envelopes and albums, documents, census printouts and family trees in binders. I have boxes of stuff and filing cabinets of stuff. One good genealogical process I hadn’t done for a while was to go back through all the information I had collected. You never know what might come out of it. As you learn more, things that meant nothing, suddenly make sense. Recently, I looked through some binders searching for information I wanted to reference. I love looking through the stuff and reading old letters again and again. In one binder I found a piece of old paper. It looked like it came from a note book but didn’t fit the handmade one that was there. That note book belonged to my great great grandmother Susan Dodds. She married Alexander Bailey in 1843 just before they came to Canada from Ireland. It was sent to her by her sister Eliza and that is all I know about her siblings and families. Who were these people and how did they connect to the family? Just looking up these dates on Family Search I found that in 1881, a Robert Dodds born about 1809 in Ireland, his son Robert and a servant Ellen Graham were all living together in Toronto. His wife Agnes had died. Robert Jr.(Bob) and Ellen Graham were married in 1883 and a daughter Gertrude was born Oct 24, 1884, also in Toronto. Gertrude appeared to be their only child. Robert senior died May 5, 1886 and then his son Bob soon followed, dying Dec 14, 1886. Both were buried in Mount Pleasant Cemetery. There was no further information on Ellen but in the 1901 census Gertrude was living with her Uncle Andrew Miller and his wife Eliza, both Irish. Was aunt Eliza, Bob Dodd’s sister? Gertrude married Samuel J Wilson and she died 18 May 1935. 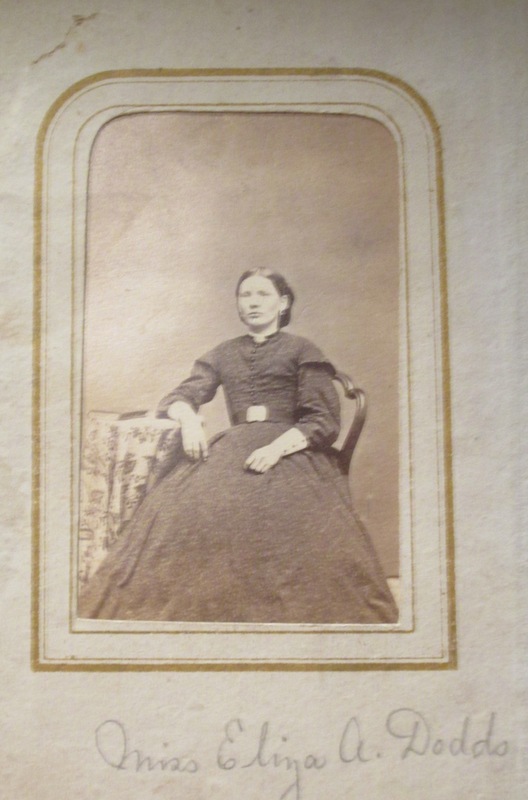 I also found a Mary Dodds who died Feb 7, 1887 at 40 years of age. Was she also Bob Dodd’s sister? I confirmed all these dates in less than 30 minutes sitting in my recliner. Unfortunately, I still don’t know for sure how these people connect with Susan Dodds, but they must be related as someone, and I think it was Susan recorded these dates. In with these family dates was the North West Rebellion 1884. This shows interest in what was happening in Canada at that time. This was the year Louis Riel was captured and hanged. I am still not sure of the meaning of Mr Peil or was it Mr Riel and Inducted buc 1884? I also have a photo album a “Mrs Barber wanted to leave to Mrs Eagle.” Eliza Jane Bailey Eagle was Susan’s daughter. In it are pictures of a Mary Dodds, Robert Dodds and Eliza Dodds. Most of the pictures have names written underneath, probably by my grandmother Minnie Eagle Sutherland, so they are all people known to the family. Maybe somewhere is another scrap of paper with answers to these questions. “Canada Census, 1871,” index, FamilySearch (https://familysearch.org/pal:/MM9.1.1/M43R-1X4 : accessed 13 March 2015), Robert Dodds, St Partick’s Ward, West Toronto, Ontario, Canada; citing p. 4, line 15; Library and Archives Canada film number C-9970, Public Archives, Ottawa, Ontario; FHL microfilm 4,396,300. “Canada Census, 1881,” index, FamilySearch (https://familysearch.org/pal:/MM9.1.1/MVFS-PXP : accessed 13 March 2015), Robert Dodds, St-John’s Ward, Toronto (City), Ontario, Canada; citing p. 152; Library and Archives Canada film number C-13246, Library and Archives Canada, Ottawa, Ontario; FHL microfilm 1,375,882. “Ontario Marriages, 1869-1927,” index, FamilySearch (https://familysearch.org/pal:/MM9.1.1/FMJC-MZK : accessed 13 March 2015), Robert Dodds and Ellen Graham, 13 Sep 1883; citing registration 015093, Toronto, York, Ontario, Canada, Archives of Ontario, Toronto; FHL microfilm 1,869,764. “Ontario Deaths, 1869-1937 and Overseas Deaths, 1939-1947,” index, FamilySearch (https://familysearch.org/pal:/MM9.1.1/JDG5-BNR : accessed 13 March 2015), Robert Dodds, 05 May 1886; citing Toronto, York, Ontario, yr 1886 cn 22384, Archives of Ontario, Toronto; FHL microfilm 1,853,483. “Ontario Deaths, 1869-1937 and Overseas Deaths, 1939-1947,” index, FamilySearch (https://familysearch.org/pal:/MM9.1.1/JDR3-1XQ : accessed 13 March 2015), Mary Dodds, 07 Feb 1887; citing Toronto, York, Ontario, yr 1887 cn 19737, Archives of Ontario, Toronto; FHL microfilm 1,853,487.